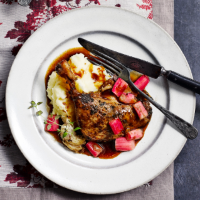 The rhubarb gives a piquant contrast to rich duck confit. 1. Preheat the oven to 220˚C, gas mark 7. Take the duck out of the bag, wipe off and discard any excess fat but reserve the natural stock in the bag. Put the duck in an ovenproof pan, skin-side up. Sprinkle with the spices, pat them into the skin, then season. Nestle the garlic and thyme into the pan, then roast for 25 minutes, until the skin is a deep gold and beginning to crisp up. 2. Roll the rhubarb in 1 tbsp sugar, then add to the pan. Roast for 10 minutes, turning after 5 minutes. Remove the duck and rhubarb; keep warm. 3. Spoon off (and discard) the excess fat from the pan, then set the pan over a medium heat. Stir in the remaining 1 tbsp sugar, scraping up any bits from the bottom of the pan. When the sugar has melted, splash in the sherry vinegar, bubble for a few seconds, then add the soy sauce, reserved stock and 1 tbsp water. Simmer until syrupy, season, then serve with the duck, rhubarb, and mashed potato and steamed greens, if liked.